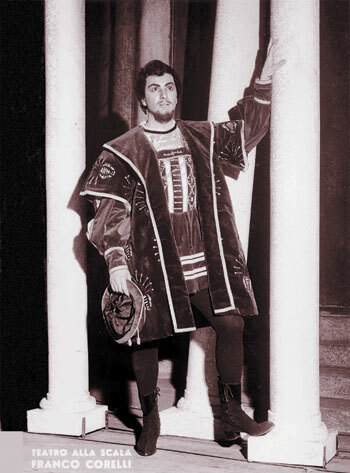 Verdi. Corelli, Ligabue, Cappuccilli, Raimondi; De Fabritiis, cond. Downloadable .M4A or .MP3 files. Total size: approx. 215MB. 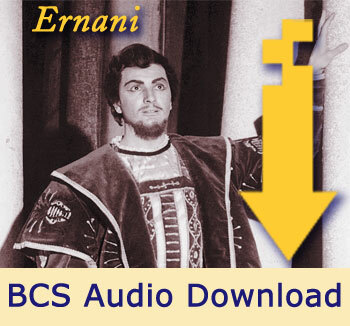 http://wp.belcantosociety.org/wp-content/uploads/2015/02/M2_Ernani_M4A2_Sample.mp3 (You’ll hear Corelli stab himself, bid his beloved farewell and die. What could be more satisfying? )In this Ernani Corelli sings tenderly, with yearning. He oozes suffering of the soul. Outlawed nobleman Don Juan of Aragon, now the bandit Ernani, asks his men to help him rescue his beloved Elvira from her upcoming marriage to her uncle and guardian, Don Ruy Gomez de Silva. Elvira, in despair about her betrothal, sings of her love for Ernani. Don Carlo, King of Spain, enters and Elvira rebuffs his advances. Ernani bursts in and confronts Carlo. Silva bursts in and challenges his two rivals until he recognizes that one is the king in disguise. The king’s retinue enters. He dismisses Ernani as one of his men. Ernani goes, swearing vengeance. Silva and the king hope for the latter’s election as Holy Roman Emperor. Carlo has come to Charlemagne’s tomb because he has learned that conspirators are hiding there intending to kill him. If named Holy Roman Emperor, he vows to rule wisely. He hears Ernani and Silva plotting to kill him, with Ernani chosen as the assassin. Electors and courtiers announce Carlo has indeed been named emperor. He orders the nobles among the conspirators put to death. Ernani, claiming his noble lineage and having failed in his assassination attempt, says he too wants to be killed. Elvira pleads for Ernani’s life. Carlo, invoking Charlemagne’s virtues, pardons the conspirators and gives Elvira to Ernani. Ernani and Elvira are celebrating their upcoming marriage. A hunting horn sounds in the distance. Ernani exclaims, “The tiger demands his prey.” Elvira, not understanding, thinks Ernani is going mad. Claiming to be in pain from an old wound, Ernani sends Elvira for medicine. Silva enters, quoting Ernani’s pledge. Ernani begs for a few moments of happiness with Elvira, but Silva offers him the choice only of poison or a dagger. Ernani chooses the latter. Elvira enters; she denounces Silva’s demands and then pleads with him. Silva says her entreaties are in vain. Ernani stabs himself. Elvira seizes the dagger to commit suicide herself. Ernani implores Elvira to love him and live. He expires, she swoons.